Not to be confused with Flat Zone or Flat Zone 2. Flat Zone X as it has appeared in the Smash series. 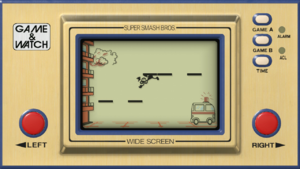 Unlock criteria Destroy 100 blocks in a game of Trophy Rush as Mr. Game & Watch. Flat Zone X (フラットゾーンX, Flat Zone X) is an unlockable stage in Super Smash Bros. for Wii U that returns in Super Smash Bros. Ultimate. Essentially, it is Flat Zone 2 with the addition of one more possible transformation: the layout of Flat Zone, based on Helmet. The Helmet layout is unchanged from its appearance in Flat Zone in Melee; the other layouts are unchanged from Flat Zone 2 in Brawl. In Wii U and Ultimate, Mr. Game & Watch is fought here when being unlocked. See the articles on Flat Zone and Flat Zone 2 for further information. As Flat Zone X is a composite of Flat Zone and Flat Zone 2, all areas from both stages appear. These include Fire, Oil Panic, Lion, and Chef from Flat Zone 2 and Helmet from Flat Zone. While most of these transformations are unchanged from prior installments, a construction worker now appears in the top right corner of Helmet to signify a stage change in a similar manner to the other transformations from Flat Zone 2. Also, falling tools can no longer OHKO upon being hit by a powerful attack. Star KO'd characters are now covered by the gas station in Oil Panic. In Super Smash Bros. for Wii U, the Ω form features a brick platform above the normal ground and blast lines are moved further back. The stage is set in the Oil Panic section and does not transition. It is visually identical to the Ω form of Flat Zone 2. When selected through Fixed Camera Smash, the stage appears to be zoomed out during the fighters' on-screen appearances then zoomed in when the match starts. In Super Smash Bros. Ultimate, the Ω form and Battlefield form are similar to SSB4's Ω form; however, the main platform is resized and reshaped to match Final Destination and Battlefield, respectively. The gas sign is also blue rather than red. The three soft platforms of the Battlefield form are bright red rectangles. The characters are still flat, which also flattens the hitboxes and alters gameplay significantly as a result. 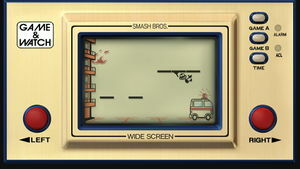 The Game & Watch game Fire (widescreen version). From 1980 to 1991, Nintendo produced handheld electronic games called Game & Watch, and there would be one game for each model of a Game & Watch. Game & Watch games use an LCD screen, the same type as an ordinary calculator, which means characters and other moving objects can only move to pre-determined locations on the screen and everything appears flat. Whenever objects move, a beeping sound can be heard. In this stage, the fighters and stage elements on the screen are all flat, and beeping sounds are heard when walking on the stage. This stage is based on a combination of Flat Zone from Melee, which is primarily based on the Game & Watch game Helmet, and Flat Zone 2 from Brawl, which is based on Fire, Lion, Oil Panic, and Chef. Notably, this stage is based on the widescreen versions of these games with the exception of Oil Panic, which was never released in a widescreen format. As with its predecessors, Flat Zone X is banned in competitive play, due to the variety of damaging hazards (such as the falling food items in the Chef scenario), the small size of the stage, the camera's refusal to zoom in at any point, the constantly changing stage setup, and the removal of the lower blast line (which makes techniques that require it, such as meteor smashes virtually useless). Furthermore, the walk-off edges allow characters to throw or spit others off the side blast lines. Four of Mr. Game & Watch's alternate costumes on the stage in Ultimate. This is the only stage in Super Smash Bros. for Wii U where Star KOs can occur but not Screen KOs, despite Flat Zone 2 in Super Smash Bros. for Nintendo 3DS having them. In Super Smash Bros. for Wii U, there's a graphical glitch where the star effect is not aligned with the Star KO'd character. This also happened in Brawl, although any other effects besides the star are now properly aligned with the character. This is also the only stage in Super Smash Bros. for Wii U to appear in All-Star Mode but not Classic Mode, despite Flat Zone 2 in Super Smash Bros. for Nintendo 3DS appearing in Classic Mode. The "GAS" sign in Ultimate's Ω and Battlefield forms does not match the colors it has in the standard form of the stage, despite doing so in SSB4. Due to the My Music restructuring, Flat Zone X has less music between For Wii U and Ultimate. This page was last edited on April 21, 2019, at 20:16.